We popped into Cuba for a couple of days on our way home. People don't generally pop in and out of Cuba and it's not really advisable, especially when the Pope's also popping in for the same couple of days and planning on generally getting in your way. We weren't stalking him, honest, although he may have been stalking us. 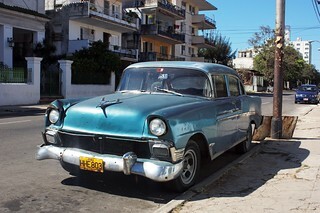 I'd long coveted Cuba as a potential cycle touring destination so knew a few things about it including that it was full of shiny old cars from the Fifties, and considerably less full of Americans. In our brief time there it was interesting to see the reality. Quite a lot of the cars (maybe a third?) still are ancient yank tanks - most of them (apart from the taxis) are not so shiny with rust patches everywhere and spewing out lots of black exhaust smoke. It's quite a sight though, and very surreal when we first arrived, especially as they were on relatively modern looking roads and not in a black and white movie. We spent our only full day in Havana trying to get air tickets home. We weren't sure when we arrived there whether we'd be sticking around, we'd become a bit holidayed out and keen to get home, eat delicious English food (actually yes, really) and allow our poor injured wallets to recover a bit - but it quickly became clear, for various reasons, that we'd definitely had enough. So we headed over to the offices of Cubana, the national airline, to buy our tickets back to London and that was when things started getting fun. We'd checked on the internet the previous night, on our casa's blazingly fast (and probably a bit illegal) 38kbps internet connection, so we knew the price of the tickets. When they tried to charge us an extra 200CUC each we were a bit surprised but when we questioned this it became clear that there was a credit card price and a cash price, and that if we paid in cash we'd get our tickets at close enough to the internet price. Which was where the fun began - there was a cash machine next door, and it even worked (not common in Cuba) but it would only give out 150CUC at a time in 5CUC bills. We'd have to do that about six times to get enough cash, and that many notes in my money belt would make me look super-fat. The next hour was spent trekking around town trying to find a decent ATM. We found one that only gave out CUP (the other Cuban currency, for locals only) and one that didn't really exist, before giving up and going back to the first one. We went into the bank and tried to use our cards to get money out at the counter. They wouldn't do that without seeing our visas, which the owner of our casa had conveniently not returned to us after taking down our details. So Dgym went to the original ATM and withdrew as much money as he could in 5CUC notes, which turned out to be just enough. He then waddled back into the bank looking extremely fat and changed them for 50's. I'm sure they put the fives straight back in the cash machine. Dgym promptly received a flurry of text messages from his ever-vigilant bank, who had noticed some weird cash withdrawal activity in a foreign country and decided to block his cards. Yay! But we got our tickets. Us: 1, Cuba: 0. It was lunchtime by then - we caught a tourist bus back to the casa to sort a few things out, then spent another couple of hours trying to get back on the tourist bus (turns out you can get off anywhere but you have to find the stops to get on, or it will whizz by and ignore you) by which time it was getting kind of late and now we were worrying about not having enough cash left to pay for our dinner and all the other stuff - the next day would be a special holiday as everybody had the morning off to watch the Pope do his thing, so the banks (and probably the ATMs too) would be closed. So we had to get off the tourist bus again at the first cash machine we saw, which fortunately worked, while I got us lots more $5 bills. By then it was about 5pm. No, Cuba's not somewhere you just pop into. For somewhere we only spent a couple of days, there's rather a lot to be said (and if you've spoken to Dgym since we got back, you'll have heard all about what he thought of Cuba!) ... more to follow! We decided to do a rainforest tour on our last day in Costa Rica, with the hope of seeing some interesting wildlife but also the extreme likelihood of seeing lots of cool trees (which are less likely to run away when they see you). Thankfully, we were allowed to stop off for an expensive but very nice breakfast of rice, beans and egg (yeah, that again) with the added excitement of a tasty grilled banana and acceptable coffee. The first part of the tour was a boat trip on the Sarapiqui river, where we saw quite a lot of birds (including cute little swallow-like things that circled the boat constantly), lots of iguanas, a Jesus Christ lizard (which walks on water, although we didn't see it do that), a couple of alligators, some howler monkeys and several local families going for a Sunday dip. Oh, and a squirrel. 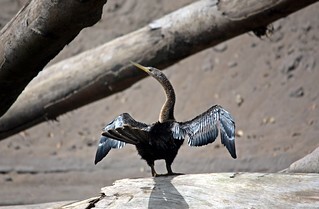 One of the more curious creatures we encountered was the Anhinga - it was described to us as a type of duck but it's not really - there is no such thing as "like water off an Anhinga's back" because, despite being a water bird, it's not waterproof and after a dive it has to spend hours drying its wings in the sun before it can fly again. This makes for quite a photogenic display (at first we thought it was posing) but sounds like asking to be dinner - there must be very few things that want to eat it. Next we were taken to the Selva Verde lodge for a walk around the trails, where we spotted some turtles, several tiny frogs, some orb weaver spiders and some ants carrying little red berries. 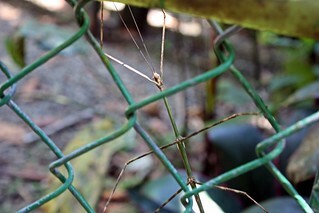 By far the coolest thing we found here was a very convincing stick insect attached to a fence. I didn't notice him at all and it was only when he moved that Dgym realised it wasn't a stick. After lunch we visited the Braulio Carillo rainforest, a vast natural park to the north east of San Jose, where it was pleasantly cool in comparison to the sticky humidity on the trail walk. There was another short guided walk where we saw tapir footprints (we weren't so optimistic as to hope to see the real thing, but it was cool to see where they'd been) and a butterfly garden, where a pretty yellow butterfly took a fancy to me and decided to take up residence on my trouser leg. Finally we got to ride through the rainforest canopy on the aerial tram, an open air gondola running at two different levels through the reserve. We saw very little wildlife, only one bird, but it was pretty spectacular riding through the dense foliage and getting a close up view of such an incredible ecosystem. 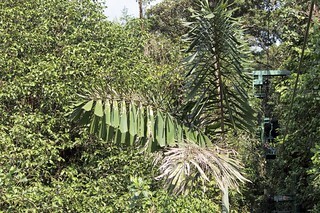 Our guide was very knowledgeable and had a lot to tell us about the different species of tree and the wildlife that can sometimes be spotted among them. We'd been particularly keen to see a sloth and, although we didn't see one on the ride, we learned that they host their own little ecosystem - there's not a lot of sloth under all that fur, which is covered in green algae which helps the sloth camouflage itself and also feeds the hundreds of beetles that live on the sloth - the beetles also help keep the sloth clean. After learning that, I'm not so sure I want to hug one any more. 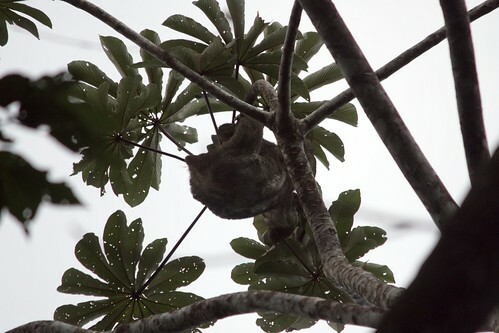 After we'd got off the tram and were preparing to leave, our guide called us over as he'd just spotted a sloth asleep at the top of a tree! It was quite high up and, even with my zoom lens, you couldn't make out which bit was which, but it made our day complete!